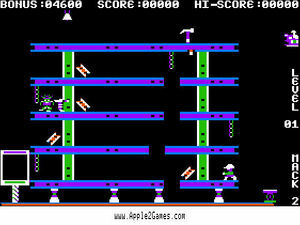 Description: One of the best platform / Donkey Kong "like" games for the Apple ][. 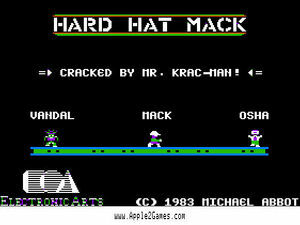 Hard Hat Mack was released by Electronic Arts years before they jumped the shark and went all jock on everyone. 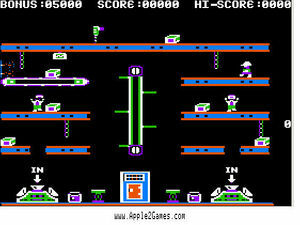 Consisting of three levels Mack, the players character must complete three different tasks. 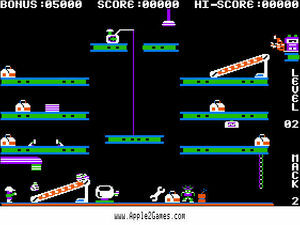 Level one consists of finishing a building by adding missing girders and riviting them into place. Level two Mack must collect all the lunch boxes that have been left on the job site. Level three requires Mack to gather all the iron bars and drop them into the rivit making machine. These tasks are hard enough but Mack must also watch out for vandals and OSHA officials who are running around on the job site. Known cheats... at the title screen press 1 2 or 3 then start the game. You will start on that level. Known Easter eggs... press ctrl-^ during game play for a message from the programmers. This page was last edited on 7 June 2015, at 11:26.